As a FREE day-long event, we are here to connect the talent and expertise within the Developer community of the Windy City. Discussions for the day have previously included development and trending topics in .net, java, open sourced frameworks, web, mobile, cloud, robotics, testing, soft skills, and more. ASP.NET Core has built-in support for MVC building Web APIs. Unifying the two frameworks makes it simpler to build apps that include both UI (HTML) and APIs, because now they share the same code base and pipeline. 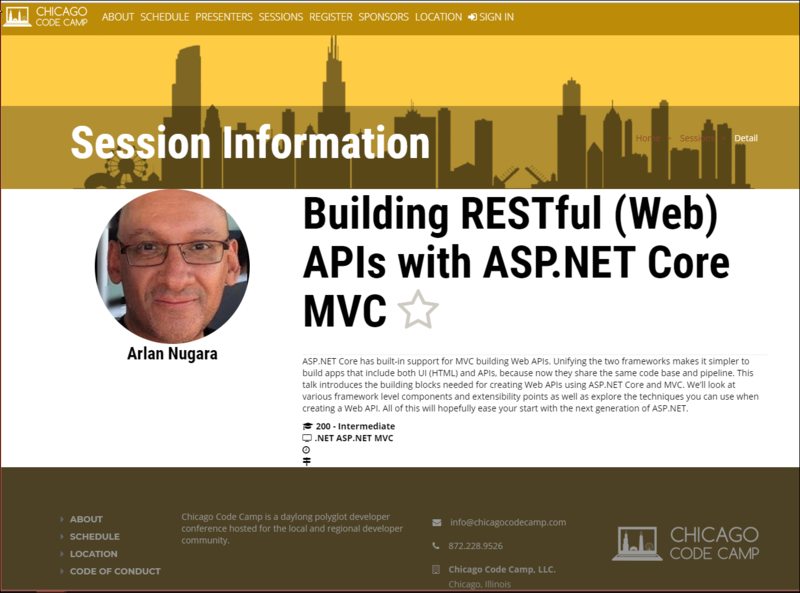 This talk introduces the building blocks needed for creating Web APIs using ASP.NET Core and MVC. We’ll look at various framework level components and extensibility points as well as explore the techniques you can use when creating a Web API. All of this will hopefully ease your start with the next generation of ASP.NET on Azure.